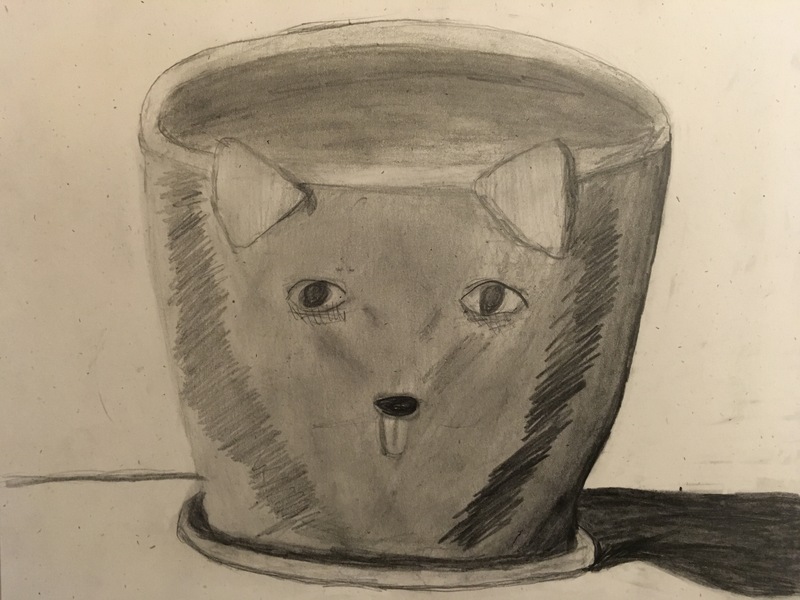 A Two Part Project- build a clay figure or pinch pot bowl and then draw it in pencil using values. The clay project can go home as a gift and the drawing is graded and returned to student portfolio. 1. SWBAT form a clay figurine or pinch pot. 3. SWBAT draw the form in pencil and shade smoothly using several values, from light to dark. 2. Demonstrate proper use of clay. 3. Roll clay into ball. 4. If making a pinch pot, plunge thumb into center and begin squeezing walls in a circular motion. 5. If making a 4 legged animal, score a “t” or an “x” on the belly and begin pulling the four legs out. 7. Demonstrate how to add pieces with scoring the clay, adding the slip and smoothing the junctions. 8. Store in plastic bag until complete. 9. When finished forming the project, let air-dry for 2-3 weeks. 10. Paint with gesso as a prime coat. I tell students that gesso is made of plaster and titanium white, so will make the projects stronger. Air-Dry clay is more fragile than clay you can fire. 11. Paint with acrylic paint— which also makes project stronger. I tell them to paint the “skin” first and then add details. The whole project is painted with thin paintbrushes. 12. When dry, paint 2-3 layers of clear gloss, which makes the project stronger and shiny. 13. Tell students these projects are not washable, water will soften the air-dry clay. This project could be adapted easily to regular clay and glazed. I tell my students that glaze is “liquid glass”, and after “firing” is permanent and washable. 14. Observing project closely, draw it on paper. 15. Start with the perceived large geometric shapes. Refine drawing and add the smaller observed shapes. Finish with more accurate lines and a blind contour drawing for the cast shadow. 16. Add values beginning with a light grey and smoothly darkening the perceived shapes of value. 17. Lines should disappear as the values define the shape and form of the object. 18. Include a table edge which would be shaded with a different value than the “air space”. I created a reflection sheet students will turn in with their drawing (attached to the back). I want to know what they liked and learned from the project, and what they would do differently next time. They also reflect on if they met the requirements (based on the procedure). Internet search for Mexican Folk Art, or images related to project. Internet search for short videos reteaching the procedures, which I continuously play in the background on MUTE, with CC (captions). Everyone loves Clay. But, it is frustrating too when you can’t achieve what you originally intended. So, we use THAT experience as an opportunity to CHANGE!